Has anyone else not received their verification email for their email address? I have requested and re-requested a number of times to no avail. Yet i have had the email from Serif welcoming me to the trial (even though i cannot download it). Anyone can download it, and anyone who meets the system requirements can install and run it. 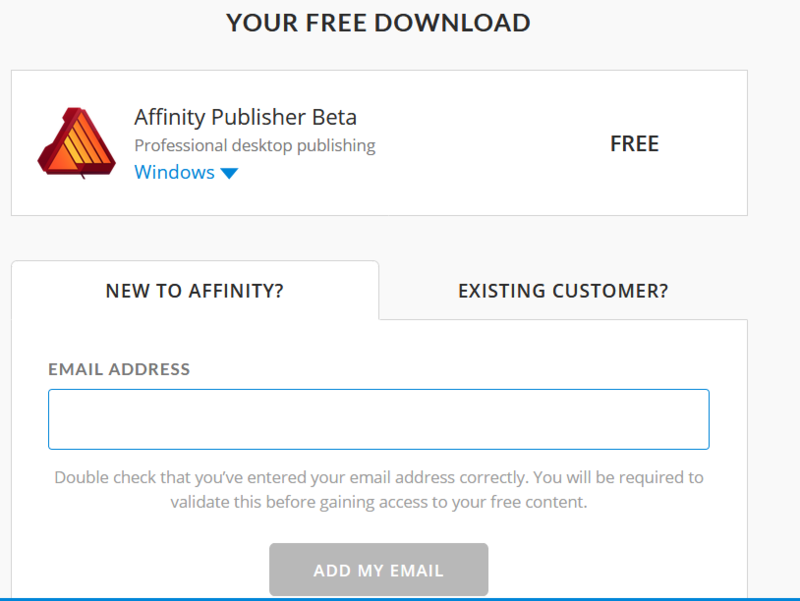 All you should have to do is click on the Existing Customer tab, sign-in with your Affinity Store account email/password, and download. I have the same problem - no matter how many times (I've tried at least TEN so far - i'm a desperate man) i verify i still get a requirement to verify before i can download. By which i mean - I HAVE verified my email many times. Multiple emails, multiple accounts, multiple browsers, multiple logins. Still get the requirement to verify. update - finally got the DL with yet another attempt, different email - I have no idea what made the difference. Very much looking forward to taking publisher for a spin this week on a couple of small projects.